▶✉ Any questions, we are all here in 24 hours for your service. Help stretch neck, shoulder muscles and back. Reduce back pain, muscle tightness and spasms. Relieve muscle fatigue due to cycling, jogging & other exercises. Equipped with comfortable foam padding and heavy duty metal hooks. Comfortably fit your ankles, ensure fully protection and avoid slipping off. Optimum time for inversion is from 30 seconds to 2 minutes to guard against light-headedness due to the change in blood flow. Prevent and relieve various diseases caused by long time sitting and standing, such as cardiovascular disease, lumbar, cervical spondylosis. 1. Firstly, open the anti-skid buckle on the boot, then one hand close the foot cover together. 2.Secondly, the other hand adjusts the activity buckle to the anti-skid buckle. 3.Finally, must be sure to confirm that the safety insurance is properly locked. ✅Note: Please Consult the doctor whether the product can be used according to yourself condition, especially for persistent back pain and make sure boot hooks are securely fastened to bar & ensure tight yet comfortable fit around your ankles to avoid injury. ✅How to use: With it, you can easily make your door become a multi-functional doorway gym to perform inverted exercises including core strengthening, leg workouts and other item. Of course, you can use it with other fitness equipment together. ✅Comfortable and Safe: Made of high quality materials. Equipped with comfortable foam padding and sturdy hooks, which can comfortably fit your ankles, ensure fully protection and avoid slipping off. The heavy duty metal hook can hold large weight on any pull up bar. 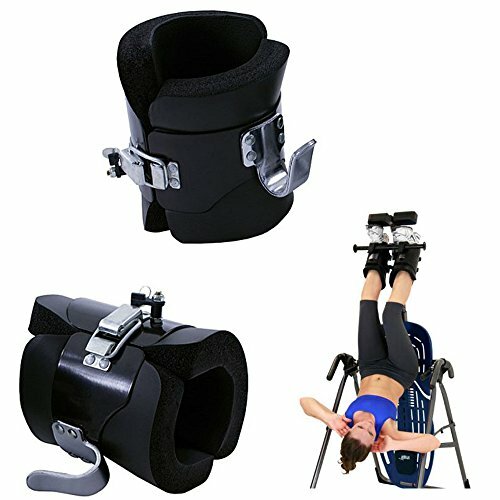 ✅Product Benefits: Hanging upside down with the boots can help stretch neck, shoulder muscles and back, reduce back pain, muscle tightness and spasms, prevent and relieve various diseases caused by long time sitting and standing, such as cardiovascular disease, lumbar, cervical spondylosis and so on. Also relieve muscle fatigue due to cycling, jogging, and other exercises.